Girly Bits Cu Blue is a deep indigo jelly with copper shimmer. All nails are 3 coats with no top coat. 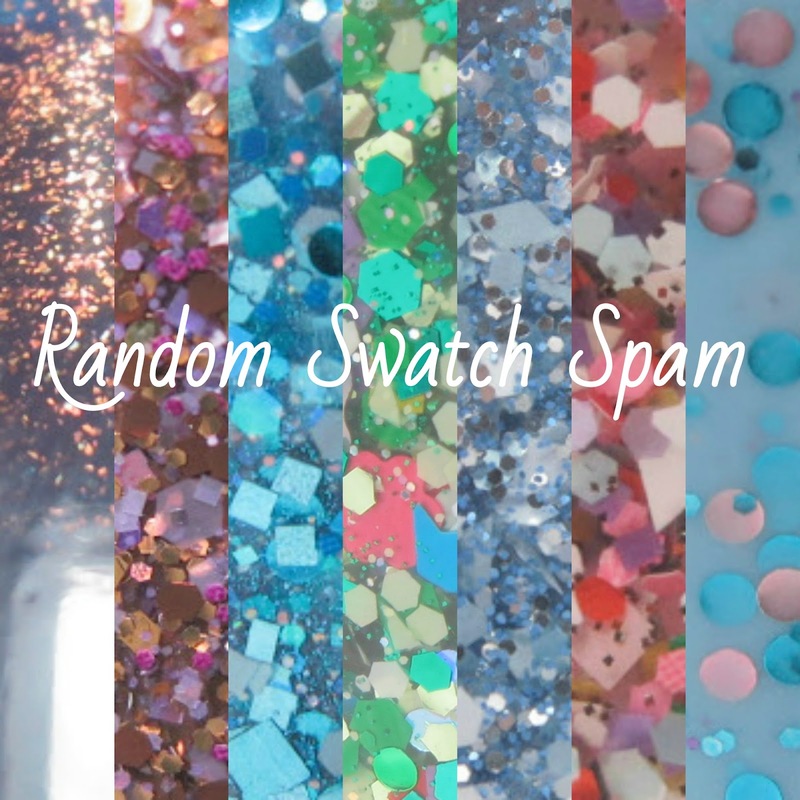 Find Girly Bits polish through her BigCartel storefront. Make sure to follow Girly Bits on Facebook, Instagram, Pinterest and Twitter. 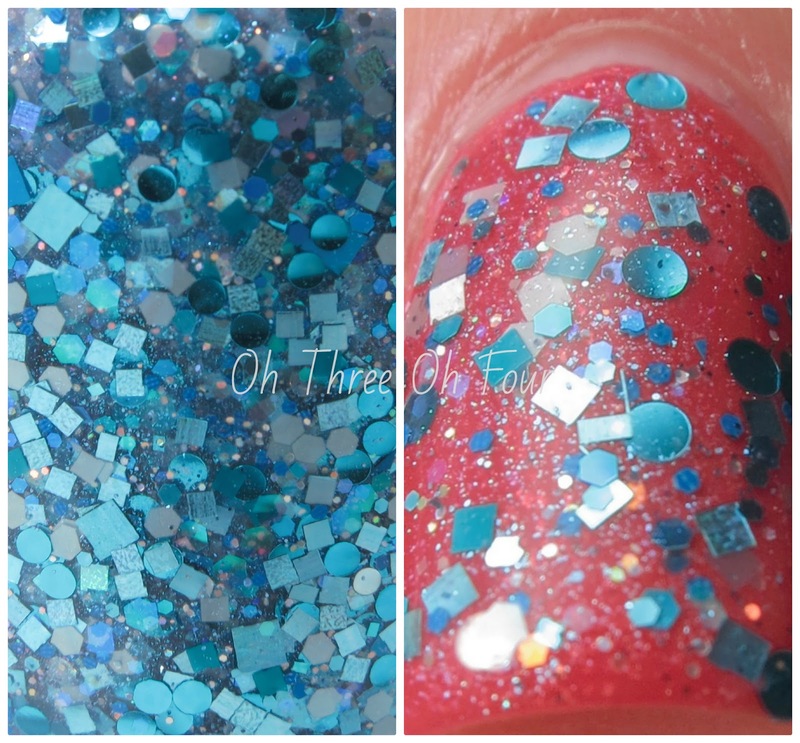 Hoof Glow Waterhole has a shimmery blue base with various shapes and shades of blue glitters. For this photos I layered 1 coat over Elevation Polish Ulura with top coat. Don't be confused you have seen both these polishes on my blog before (and the manicure below this) ;) This is 2 coats of Silly Bee's Chickadees Diamond Deb layered over 3 coats of Crema with top coat. Here again is another Silly Bee's Chickadees fun manicure. I again used 3 coats of Crema and topped it with 2 coats of Melly's Mix. Melissa, the creator of Silly Bee's Chickadees, is visiting a convention soon and wanted to show off both these polish together and asked me for photos. I thought I would share them because they really are awesome combos! Due to the convention Silly Bee's Chickadees Etsy shop is currently closed till July 1st. Be sure to follow her for a reminder when the shop reopens on Facebook (I also know there are some new colors coming soon ;) and follow her blog! Smitten Polish Traveling By Bubble is pink and blue circle glitter, along with a bit of small pink and blue hex glitter, in a milky blue base with a touch of blue shimmer. All nails are 3 coats with top coat. Purchase Smitten Polish on through Etsy. Follow Smitten Polish on Facebook and sign up for their newsletter, to stay current on new colors being released and stock updates.